Hand-painted ceramic tiles add a personal flair. Rolling out the clay slab. Nikki hand cuts the template pattern. The fired clay is painted with glaze. The finished tiles are assembled on fiberglass mesh in preparation for the final installation. Nicole (Nikki) Lemkemeier is the equivalent of two artists in one body. She is an accomplished painter, as well as a ceramic artist. 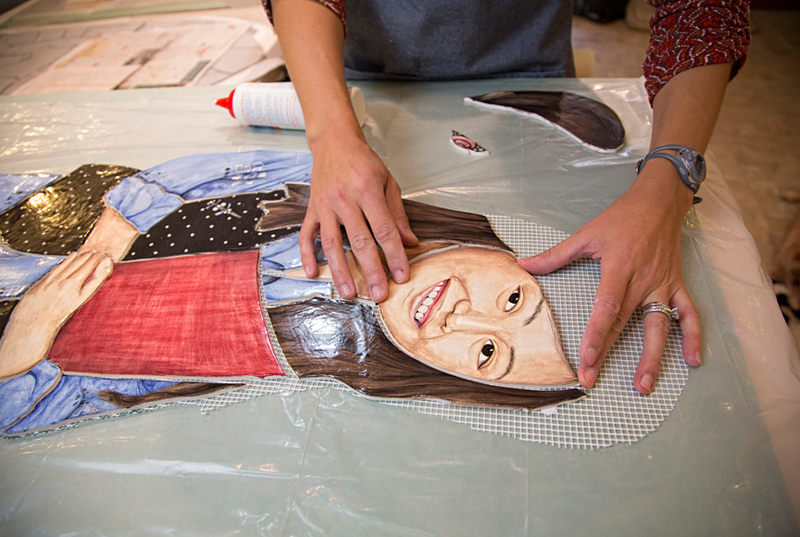 She has combined these two arts into one by making painted-tile mosaic installations. 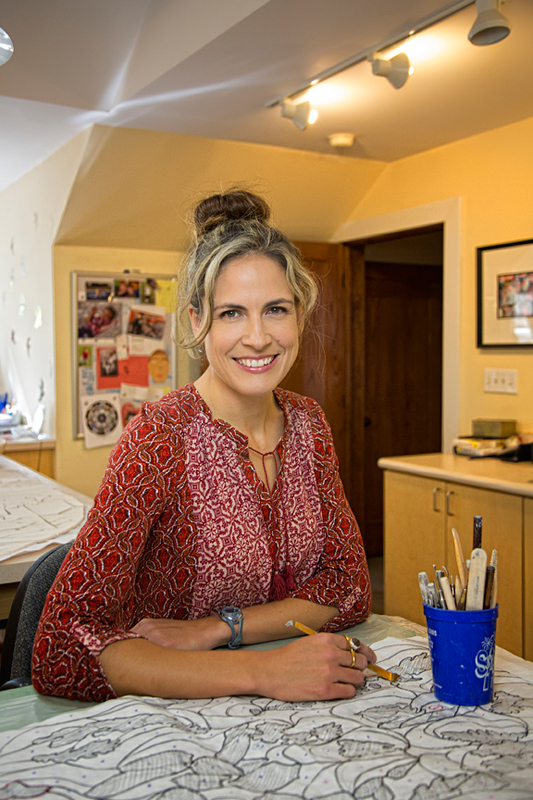 Her work is a combination of classic painted tile work, plus the originality of handmaking the tiles and cutting them into small, irregular pieces that fit together almost magically – like a puzzle – into an appealing, intricate work of art. 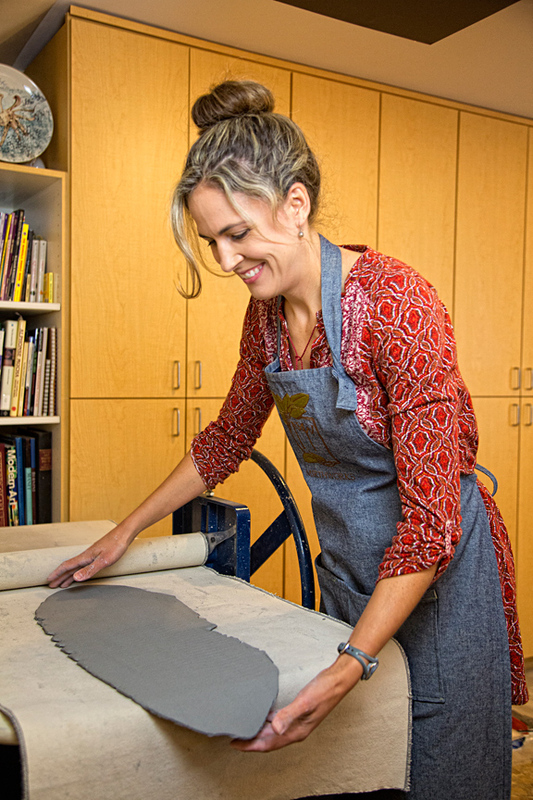 Her love of art led her to major in printmaking at Washington University. 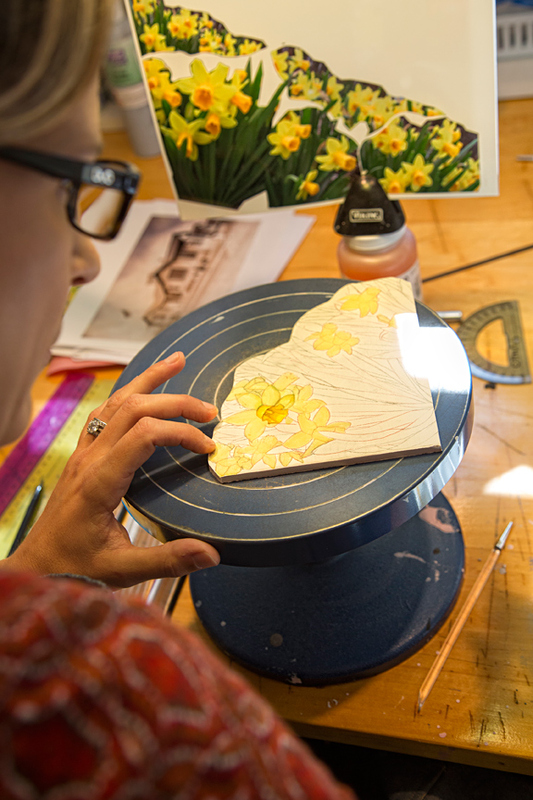 “My first job after college was painting wildflowers on ceramic tiles—it was the first time I ever had any experience with tiles and I fell in love with it,” she says. She soon learned to make the tiles herself and combined it with her painting skills to create her own unique art. She's been working in this combined medium for 15 years. 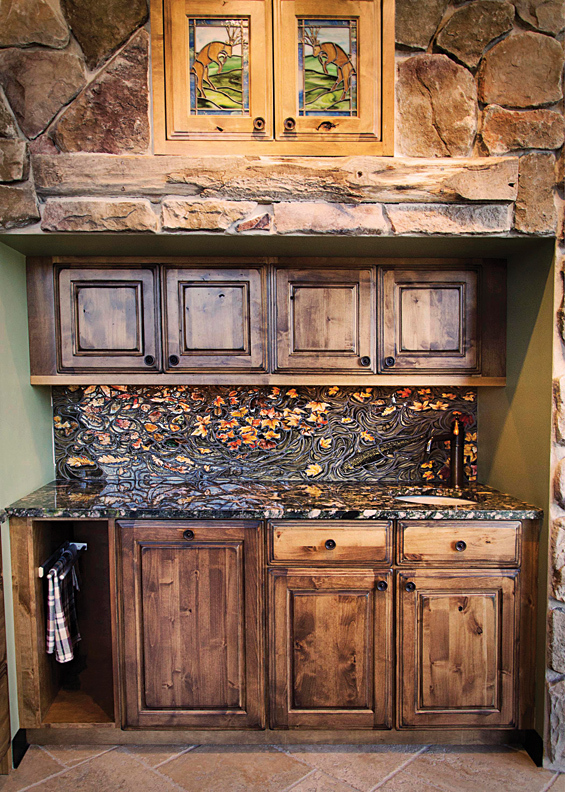 Nikki’s first piece is one of her favorites, a kitchen backsplash featuring a dogwood tree. She made every blossom and branch individually, and she cut the tiles along the branch lines for a more lifelike appearance. Another original backsplash features a trout pond. Leaves appear to float on top of the water, while trout lazily swim underneath swirling water. 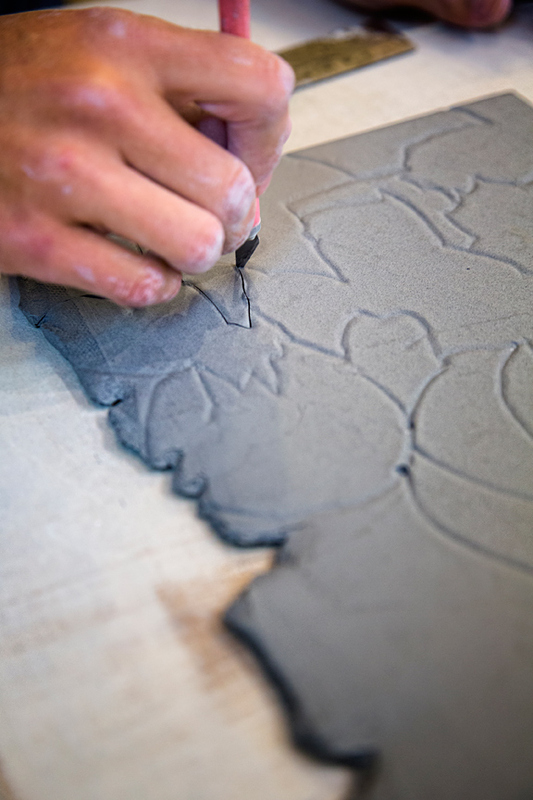 Tiles are cut along swirling lines, adding movement to the piece; the shiny overglaze adds to the illusion of water. For another client, Nikki created a sign and installed it above a window in an Italianate, Renaissance-design kitchen. “I had to match the colors, the style and hand-letter the personal saying. I really enjoyed the challenge,” Nikki explains. Lemkemeier's work is on display throughout St. Louis. A few places to view her work include RSI Kitchen and Bath, The Magic House, City Academy and Community School. “I love the happy accidents, and opening the kiln to see what has turned out. I love combining imagery with graphic lines. I love making art that people want to look at. It means a lot to me,” says Nikki with a smile.